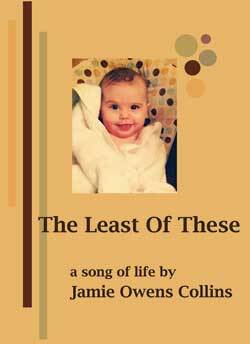 When we first heard Jamie Owens Collins she was a young girl, cialis albeit one who could sing and write classics like “The Victor.” Today she teaches women’s seminars, writes songs such as “The Battle Belongs To The Lord” and “You Have Broken The Chains,” (which she sings for the first time on her latest release) and still finds time to home-school her three teenagers. The many aspects of Jamie’s life as an artist, wife and mother in the 90’s have developed into a ministry which reflects the changes she has experienced over the years. She has matured as the seasons of her own life have deepened her awareness of God’s grace, greatness and compassion. These changes are mirrored in her latest release, SEASONS.